Last week was all about past quests. This week, it's all about Dimension of Disaster, our epic 200th quest. Are you ready to celebrate? Last year, we asked you to produce a film poster for your favourite quest – and we were blown away by your entries. So now, we'd like you to produce us a film poster for Dimension of Disaster! 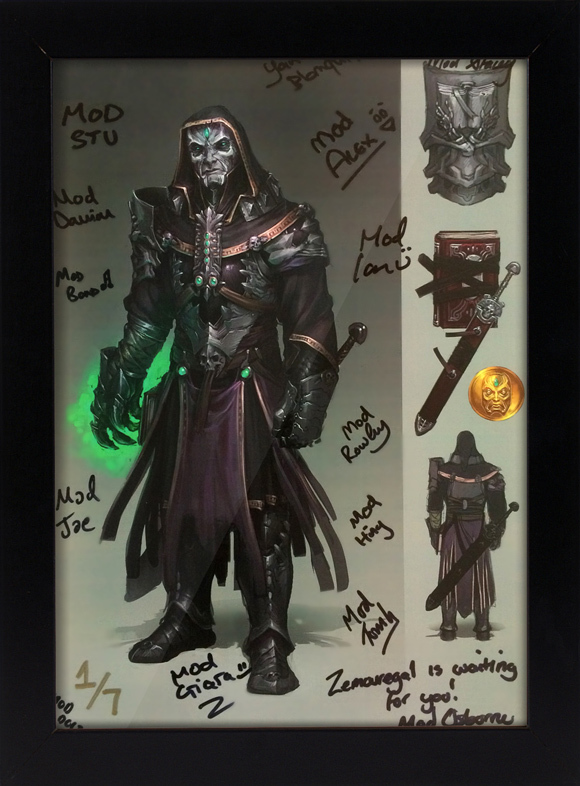 You could win exclusive, signed 200th quest concept art (below), and three months' membership if yours is our favourite. Remember – there will only ever be seven of these prints commissioned in the world. Make sure you don't miss out! Play through the quest, get some ideas, and be creative! Submit them to our Facebook Competition Page, via Twitter or Instagram with the #200thQuestFilmPoster hastag, or to the Competitions Mailbox, and help us to celebrate the 200th quest! Good luck. Take a look at the FAQ for more information. We mentioned this last week, but from reset on Saturday morning (00:00 UTC, 28th March) to reset on Sunday night (00:00 UTC, 29th March), we'll be running a challenge. Who can gain the most quest points in 48 hours? You'll need strategy, a knowledge and love of questing, and dedication to win this one-off competition. So – what can you win? Well – first up, you'll grab yourself an IRL Godsword. Second, you'll get yourself an exclusive, one-of-a-kind title – the 'Questival King' or 'Questival Queen'. Thank you for your feedback regarding the prize system. As a result, we polled alternatives last week. We're now implementing the winning option. All players with a quest cape will be able to unlock the 'the Ultimate Quester' title from Monday 30th March. Write a Quest in under 200 Words! Over on our forums, we've got something for all you lore-lovers and aspiring writers – can you write us a quest in 200 words? Check out the competition thread for details – there's signed, framed, exclusive 200th quest artwork up for grabs! Our Questing AMAA went down a storm last week, and this week, it's all about the forums. From 18:00 UTC to 19:00 UTC on Wednesday, March 25th, you can ask the team behind the 200th Quest anything you like about it! Head to the Recent Game Updates forum at around 17:30 UTC to ask your questions. How we came up with the idea for Dimension of Disaster, the development process, graphics, audio – you can ask us anything! We'll set up the forum thread at 17:30 UTC for your questions. Hope to see you there! We have two Questival events for you this week, and they're set to be absolute crackers! Quest Party and Scavenger Hunt around New Varrock with Mods Jon, Kalaya and Neena, Friday from 15:30 UTC. The party will be hosted in the Empyrean Citadel, so make sure you've completed 'Missing, Presumed Death'! Spooky Questival Party with Mod Lee, Sunday 01:00 UTC. Set in Fenkenstrain's Castle, it's set to be an epic way to round off Questival! You can find out all the details for these events in the Events and Competitions forum. Our Quest-themed Players' Gallery! If art is your thing, get those paintbrushes out and enter for the chance to win one of our exclusive signed, framed 200th Quest pieces of artwork. Congratulations to No More Div, who won the Quest Face-off competition! He got every prediction correct, and so will take home an amazing piece of signed and framed artwork. Also, congratulations to Dr PvM, winner of our Broken Home speed-run, completing the quest in 21 minutes and 42 seconds! Get involved, and let's get celebrating 14 years of questing! 1st! I'm excited about "the ultimate quester" title. Will this title come off every time a new quest is released, like the quest cape? An IRL godsword would be so cool. I'm not going for it, but it would be fun to play with. Chop off an IRL friend's head, lol. How will the sword be sent to the winner? It'll be like the Completionist title in that you'll need a Quest Cape (i.e. to have completed all current quests) to use it! Can't wait to get that title. I'd love to write a quest in under 2000 words, but the link doesn't seem to go anywhere. This. Can't find a particular thread for it on relevant forum either. But prepare to go down all. This is my jam. Literally spreading it all over my toast now symbolising how i'm going to devour the competition. The link for the 200-word competition doesn't seem to work. It just redirects me to the forum home.